Preheat the oven to 425 degrees F. Coat a baking dish with cooking spray. Whisk together the lime juice, vinegar, brown sugar, nam pla, red curry paste, one tablespoon of the cilantro and the mint. Place the salmon fillets in the baking dish — try not to crowd — and pour the dressing over the fish. Roast 12 to 15 minutes until the salmon is flaky. Sprinkle with the remaining cilantro and serve. Serves four. 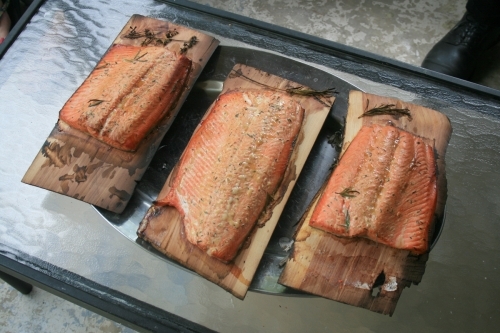 If you’re the adventurous type, try baking the salmon on cedar planks. It adds a rich smell and taste. A good wine to go with salmon would be Chablis or Sake if you’re eating the salmon raw, Sauvignon Blanc if it’s broiled or fried, Semillon or Seyval Blanc if it’s in wine sauce, and Beaujolais if it’s in any other sauce. Salmon goes well with any vegetable, including asparagus. It’s notoriously high in beneficial omega 3 fatty acids. Enjoy!